Northeastern Wisconsin shares its coastline with Michigan, and the communities that border Lake Michigan are popular destinations for tourists. If you enjoy fishing, maritime museums, natural beauty, or a good football game, this area of Wisconsin is for you. 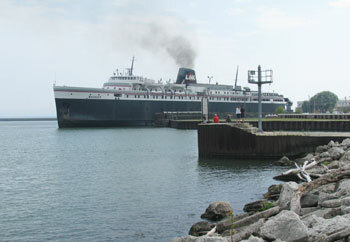 This is the Wisconsin destination for the S.S. Badger carferry that sails every summer from Ludington, MI across Lake Michigan. It makes for a great shortcut for westbound travelers, saving gas, time, and money. Manitowoc has a rich maritime history, and its main feature is the Wisconsin Maritime Museum, one of the largest nautical museums in the country. Fishing, water sports, golfing, hiking, and biking are some of the great outdoor activities Manitowoc is known for. Check out our story on Manitowoc, Wisconsin. Called "the Cape Cod of the Midwest," Door County is surrounded by water on three sides and juts out into Lake Michigan. It has 300 miles of shoreline, five state parks, numerous fruit orchards, and is known for its summer theater company, the oldest in the nation. Its main city is Sturgeon Bay, the B&B capital of the Midwest. 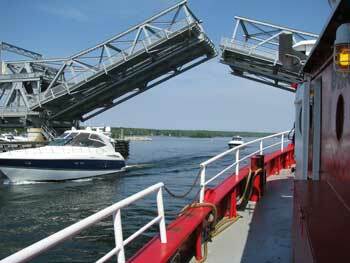 Lighthouses, waterfront cruises, and historic vessels are all part of Sturgeon Bay's charm. Visitors flock to Door County every year for its beauty and abundance of activities. Learn More About Door County, Wisconsin. 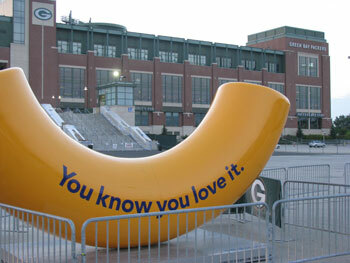 If you're a football fan, you know this is home to the Green Bay Packers, one of the oldest teams in the NFL. Green Bay is also known as "Titletown, USA" for the 12 NFL titles it has earned, including three Super Bowls. It is the third largest city in Wisconsin...with several meatpacking and paper plants. Here you'll also find wineries, parks, botanical gardens, and great fishing. If you're traveling from Michigan, take the S.S. Badger carferry over to Manitowoc, then drive a very short distance up to Green Bay. Find out More About Green Bay, Wisconsin. Known as "The Waterpark Capital of the World," Wisconsin Dells is a vacation paradise for families...as well as couples who like to enjoy the spas, golf courses, and luxury resorts. Located north of Madison, Wisconsin and 164 miles north of Chicago, this area of the Midwest boasts terrific sports and recreation, theater, museums, amusement parks, and more. The summer is the most popular season, but fall with its spectacular colors and pristine white winters make Wisconsin Dells the place to go for fun and relaxation. More Information About the Wisconsin Dells Here.